Title [Boys playing in an outdoor swimming pool] [graphic]. 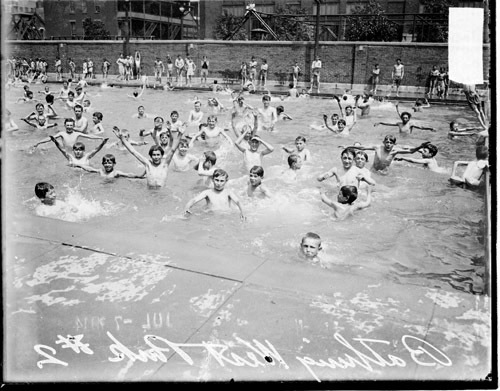 Collection summary Image of boys playing in an outdoor swimming pool in a park. Many other boys are lined up around the edge of the pool in West Park #2 in the West Town community area of Chicago, Illinois. Text on the image reads Bathing West Park #2. West Town (Chicago, Ill.) 1910-1919.